The Cumberland & Dumfriesshire Farmers Mart P.L.C. had forward 5,019 breeding sheep at their special sale on Tuesday 13th October 2009. Buyers were present from a very wide area . Lowland breeds easily maintained late high rates. Top was £86 & £83 for Greyface ewes from Castle Nook; Suffolk x £86 Westhouse; Texels £80 Haithwaite; Lleyns £78 Height; North Country Cheviot £66 Hillcrest & Scarthlees. The final draw of shearlings realized £84 for Greyfaces from Acreknowe, £82 Low Eals; Texels £74 Stackbraes; North Country Cheviots £78 Bayles; Blueface Leicester £70 Dunshiel. Ewe lambs to £78, £72 for Greyfaces from Wanwood Hill, £70 Old Hall; Cheviot Mules £78 Philiphaugh; Texels £76 Crumhaugh Hill; Beltex £61 Byers Farm. Hill ewes were a large show and realized the best trade of the season. Top was £61 for Cheviots from Bowershield & Whitchesters; Blackfaces £54 Sundhope, £53, £52 Megdale, £49 Skelfhill; Swaledales £54 Baggar Yeat. Shearlings to £57 for Blackfaces from Collin Bank. Ewe lambs to £50 for Hill Cheviots from Braidley, £46 Carlenrigg, £44 Tushielaw, £43 Crossdykes; Blackfaces £39 Sundhope. The Cumberland & Dumfriesshire Farmers Mart P.L.C. 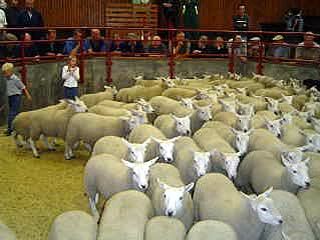 had forward 6,018 store lambs (including 1,985 Cheviots) at their sale on Tuesday 13th October 2009. Store lambs were a big show and with more buyers present met a strong trade. Top was £57.20 for Beltex lambs from Greenside Farm, £52 Glendearg. Texels £55 Gibbs Hill & Greenknowe, £54 Crops Hall; Charollais £50 Lochwood; Suffolks £54 Greenknowe, £53 Leahaugh; Greyfaces £56 Mossband House, £54 Leahaugh, Gibbs Hill; Blackfaces £48 Gibbs Hill, £47 Horseholm; Swaledales £43 Underbank. Cast ewes to £47.50 Crookburn. Cast rams to £55.50 Crookburn. The Hill Cheviots were a similar entry with trade the best of the season selling to £50 Granton, £47.50 East Murton & Hownam Grange, £47 Linhope & West Deloraine.